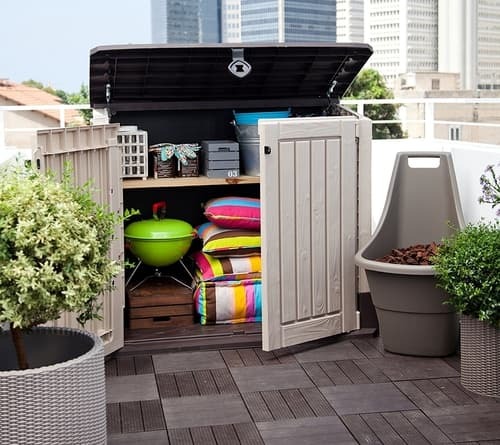 With the Keter Store It Out Midi outdoor plastic garden storage shed, you have a good sized storage space, that can hold a range of items such as your gardening tools, plant pots, patio accessories. You can also use them to store a couple of wheelie bins if you want to keep those bins looking neat and tidy, and free from cats and dogs. Some buyers used this to store bags of coal and some also used it to store their mobility scooter. It certainly has plenty of varied uses. It has maintained this rating from thousands of online buyers. Many of those buyers have taken the time to leave a review. With that number of reviews we can tell you right away, that the Keter brand have sold thousands of these, to many happy and content buyers. As you can see this shed looks great, and it has been cleverly designed to meet the needs of most UK households. This is the midi size and if you prefer to read about the Keter Maxi size, then please click here. Let's have a closer look at the Keter Midi model, in this detailed review. As part of our research we discovered that you can buy this online and at some gardening stores with a recommended retail price of £99, We also know it gets good online buyer ratings of 82%. However we now want to have a closer look at what it has to offer in terms of features and storage.. In summary this shed is made from plastic panels with a wood effect look. It has an 845 litre capacity so holds a lot. That is not quite as big as the Keter Max version which has a 1200 litre capacity. Alternatively you can use this to hold up to 2 x 120 litre sized wheelie bins, and many UK buyers make this purchase for that specific reason. This is a tough garden box that is is weather-resistant and virtually maintenance and fade-free. It has a heavy duty floor and a padlock hasp that completes the unit. To open the storage unit, you can simply lift the top lid, or if you prefer there are two doors at the front which you can pull open. Below you can find a couple of images of this Keter storage shed. Please click on each to see a bigger version. We found this very good review on YouTube, and we think it does an excellent job of explaining exactly how the benefits of owning this storage shed. The online buyer satisfaction rating is always something that you should have a look at very closely. As you can see the average buyer rating for this shed is a pretty solid 82%. It has maintained that high rating for a few years. When I checked all the online reviews, I discovered that around 60% of those buyers rated this one very highly, and in essence gave this shed the full 5 star treatment. Around 8-9% of online buyers said that this product was poor and that they didn't like it or rate it that highly. I shall certainly check why that was the case and have shown that just below. Keeps out the rain and that is very important. 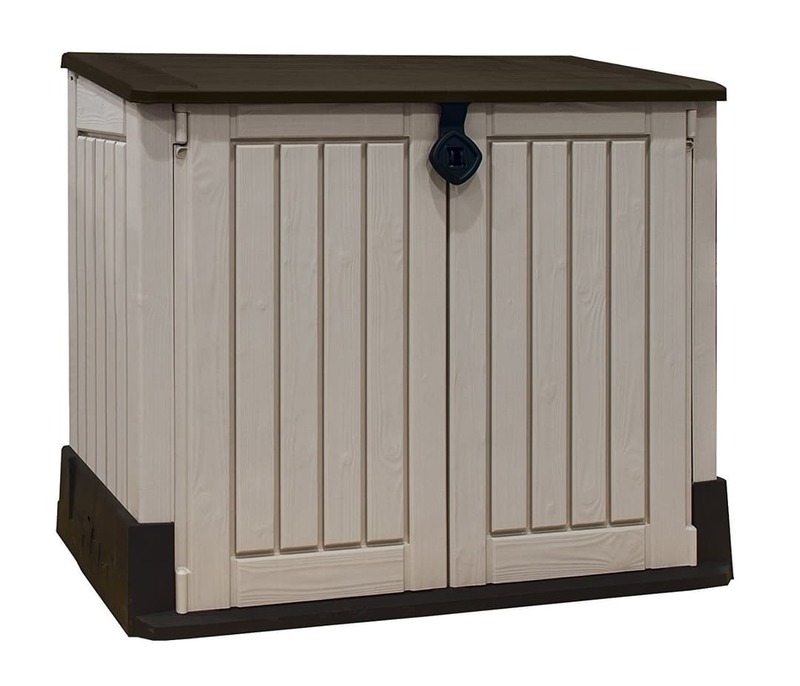 Clearly from the buyer reviews, this is a smaller storage shed that is pretty versatile and has been used for many different storage solutions. Popular uses are for garden tools and mowers. 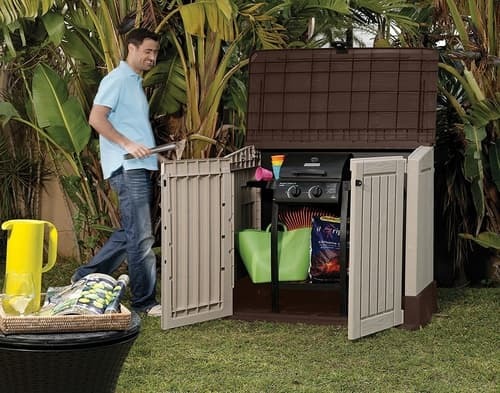 After that the use for this shed varies a lot from BBQ gear, to patio cushions, to kid's toys and just about anything else you can think of. At the end of the day it is just a sturdy plastic box with a lid and two doors. However it does keep your things dry, and the ventilation ensures that your items don't get damp or covered in mould. It is a good solution for gardening tools, and the many things we seem to gather up around the garden and patios. I liked the fact that it weathers well. Quite often these can get more abuse than is ideal. They are not really made for sitting on, and many buyers said that kids tend to swing on the doors if they are left open. If the shed is well positioned and cared for then it does last a long time. If you are buying this to store wheelie bins, then check the actual sizes of your bins first. Some areas in the UK use 120 litre bins, some use 180 litres and some use 240 litre bins. This model can hold the 120 litre size. You will need the Keter Maxi for the larger wheelie bins. This is not hard to assemble, but I would strongly recommend having 2 people doing it, as it makes the entire assembly process a great deal easier. Also make sure that the ground is level where you are going to locate it. Avoid slopes as it will make the doors not close properly. Quite a few buyers recommended using a Stanley knife to trim some of the lock mouldings as that helped make a better and neater joint in the plastic.